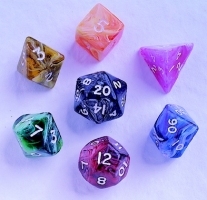 Floating Dice is a tool for people who need everything from 4 sided to 100 sided dice. I designed the window to be very small to avoid having it get in the way. Floating Dice is run on a floating window. You click on the button with the number of the dice which you want. It will display a random number as if you threw that type of die. Additionally, on the far right is a popup menu which will let you change the number of dice thrown. You can select between 1 and 5 dice.